I haven’t decided if I enjoy cooking breasts, drumsticks, thighs or roasting a whole chicken best…YOU tell me… What is your favorite?? Here is the general recipe you can adapt it however you want based on the cut of meat you are using. I love recipes like this because you can use it for so many different types of meals. Also a little note: you can make this in the crock pot place balls of foil under the chicken then add the ingredients in around the w hole chicken at the bottom of the crock pot, set on LOW for 6 hrs and you’ll have the most amazing crock pot Lemon Rosemary chicken EVER!!! 3-5 Lemons – honestly, you really cant go wrong with more lemons. 4-5 sprigs of rosemary… you can dice up the leaves and sprinkle over the chicken or leave them whole…again your preference. 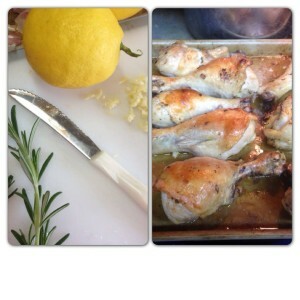 slice lemons and squeeze juice over the chicken. If you are cooking a whole chicken, stuff the body with the squeezed lemon wedges. If you are cooking drumsticks or breasts on a cookie sheet you can still lay the lemon wedges on the cookie sheet around the chicken. Sprinkle or set the garlic and rosemary in/around the chicken then pour the wine and vegetable broth over the top of it all. Cover the chicken with foil for the first 30-40 minutes and for the last 25 minutes bake the chicken uncovered completely. Chicken Breasts/thighs: Bake at 425 degrees for 1 hour. IF you are making Chicken Breasts or thighs you can use the Ingredients to create a marinade for them to soak in over night, and then baste them with it while they cook. 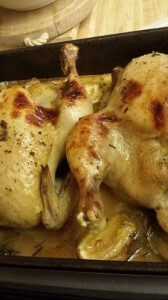 If you are cooking whole chicken in a roasting pan, OR in the crock pot let all the ingredients fall to the bottom of the dish and cook with the meat that way. In just about an hour you will have an amazing looking chicken that will taste AMAAAAZZZIIINNNGGG! !